Saving a few bucks for something you don’t really need drives a lot of people crazy. Moreover, it’s tragic when somebody gets killed all because of a sale. A 34-year old temporary worker at Wal-Mart was killed this morning at a Long Island branch when hundred of people stampeded into the store at 5AM. The deceased tried to hold back unruly crowds trying to get into the Valley Stream branch of Wal-Mart during the store’s opening. The crowd knocked him over and he was trampled to death. Wal-Mart also released a statement regarding the incident. "The safety and security of our customers and associates is our top priority," Dave Tovar, Wa-Mart spokesperson said. "Our thoughts and prayers are with them and their families at this difficult time." 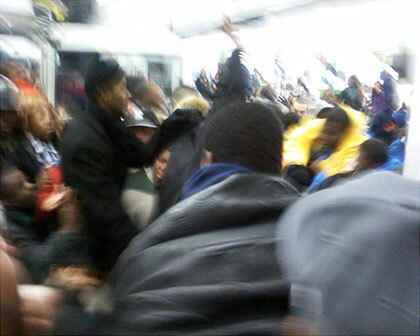 Of course it’s probably not Wal-Mart’s fault and it would be impossible to charge the crowd with a crime. However, as human beings, have we grown to be so stupid to forget safety all for the sake of getting a good deal? Besides, I’m sure that the people weren’t there because they desperately needed to get something. I’m sure that that employee died simply because of greed and a discount. Tragic.